Is business booming and now you need a site dedicated to incoming business from an emerging market? Have you invested heavily in an e-commerce site and want to leverage the existing code base for any of the above? If you answered yes to one or more of the questions above, you're probably going to want to leverage multi-site capabilities in your E-Commerce deployment. However, before you dive in headfirst (into the abyss), you must consider the additional complexities involved when managing multiple sites and a single or forked code-base. The most important question during your journey down the multi-site implementation road will be the following: What website assets and code resources should be shared across sites and what should be omitted from sharing (and understanding the WHY?). The immortal Notorious B.I.G. sums it up quite nicely with his rap classic Mo Money Mo Problems: "It's like the more [websites] we come across the more problems we see..." or something to that effect ... you get the picture!! As you can see, there is ample opportunity to share most any aspect of your web-store using Oracle Commerce. During the initial phases of your multi-site project you're going to want sit down with business and IT stakeholders and decide what makes sense in terms of commerce resources to share. For example, a company with several distinct brands may present multiple store fronts. To enhance the experience for prospective online shoppers you may want them to be able to load up their cart across websites; i.e., they can add items from "website 1" and then at a later time visit "website 2" and see the items from "website 1" already sitting there from their previous online visit. Maybe this is what you want ... and ... maybe it's not what you want at all. Some organizations value brand separation and providing their customers the "appearance" of separate corporate entities (even though they may not be). 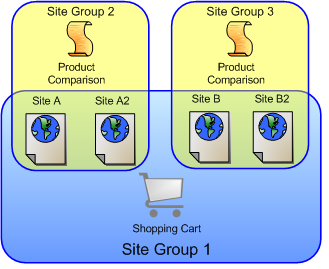 Shared commerce site component behavior can be fine tuned in Oracle Commerce (as seen below). This is exactly the sort of thing you must analyze and determine what the best usage is for the available multi-site features given the context. Oracle Commerce Experience Manager (you probably know it as Endeca XM) supports multi-site applications using a single MDEX Engine. Within an application, you can create sites. Each site in a multi-site application contains its own data and pages. These sites are collections of content and features that an end user experiences through a unique URL. This URL might contain a unique domain (brands) or a unique path within a domain (microsites or country sites). Assets known as site filters can be used to limit the display of data to a subset of the search index for a particular site. Business users can create and manage specific pages for a site with Experience Manager (XM) while also sharing elements of the experience. The ability to promote individual sites to new environments was not introduced until version 11.2. Depending on the version you are running and the design you have chosen you will probably introduce additional complexities in the simple day-to-day management of your deployment. 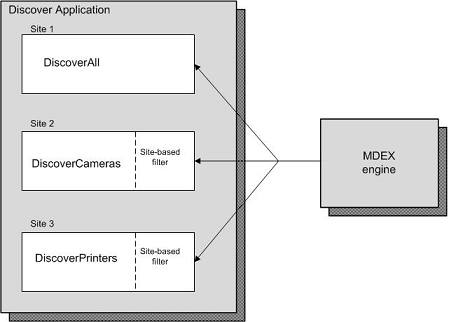 For example, publishing and environmental promotion of shared content and code assets including shared indexes and cartridges may be linked depending on what was shared and how. You will need to think about these implications before moving forward with your guided search multi-site design. Multi-site management is hardly a new concept! WebCenter Sites, formerly Fatwire Content Server, introduced multi-site capabilities around version 2.0/2.1 (circa 1999) which was more than 133 years ago (that's the number in dog years which are very similar to software years!!!). With multi-site, the goal is to effectively implement and maintain a multi-site infrastructure. As with the Oracle products discussed previously, the heart of the matter for spinning up a new site in WebCenter Sites is the share or copy decision from your "source" site to your "new" site. Once you have decided which asset types/subtypes, content assets, templates, and code elements to share or to copy, WebCenter Sites provides a utility called Site Launcher to help you quickly do just that. The share or copy decision process may be driven based on business need but the impact of the decisions on your IT organization must also be considered. A sort of cost benefit analysis must be done in order to insure the right balance of share vs. copy is done with code and site assets. Shared code elements when enhanced and deployed immediately, impact all sites using that shared code, where as copied code elements require each forked code base to be edited, tested and deployed for the new enhancement to be present in each of the sites using a copy of the original. This can and will add significant resource requirements and complexity to maintaining your WebCenter Sites deployment. Asset model design is the splitting up of a web page into logical units so that they can be best reused across multiple locations. This is very important to multi-site management. Fortunately, if you already have a production website running on WebCenter Sites you will done a fair amount of this already. In order to fully ready your system to support multiple sites (in terms of shared resources) you will probably need to do a bit of asset model refinement, and/or to possibly introduce new asset types or subtypes after meeting with the new site's business stakeholders. As you can see, the decisions your organization makes as to which multi-site features to implement (and why) and which code / website resources to share or to copy, will have a direct impact on the IT resources and complexity required for multi-site implementation and maintenance. If you need assistance in thinking through some of the options that make sense for your organization don't hesitate to contact Function1 ... we're only a CLICK away!! 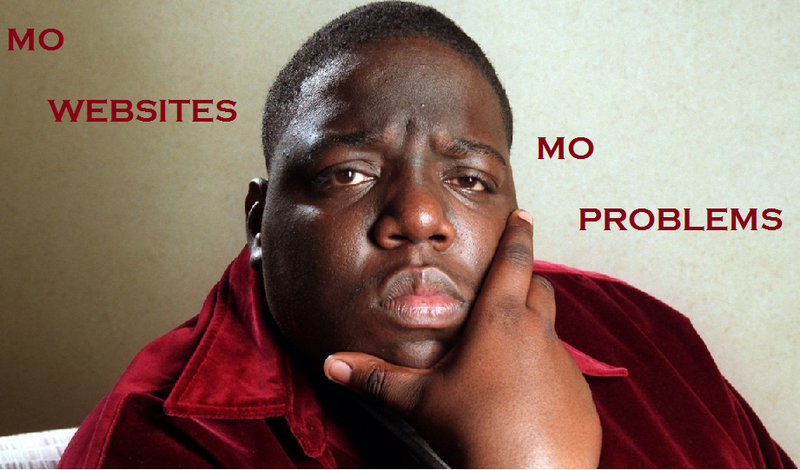 Biggie Smalls was the ILLEST! !